I am using the awesome artwork of Maryline Cazenave. Paste frame 1, duplicate and resize to 90%, click inside the larger frame with your magic wand, expand by 5, paste paper 4, or one you prefer, invert and delete, move to the bottom. Paste element 27 and resize to 70% and place on the paper layer toward the top, duplicate and move down some. Paste your tube on the right side. Paste element 12, mirror and free rotate to the right at 15 degrees and place behind your tube layer. Paste element 16 and resize to 50%, place on the left side below the tube layer, duplicate and slide out a bit. Resize element 1 to 50%, place behind the book layer. Resize element 3 to 40% and place on top of the books on the left side. Paste paper 2, apply your mask, delete and merge group and make larger to 110%, move to the bottom. Back on the top later, paste element 14 and resize to 35% and place toward the left side. Then type some kind of saying you would like your tag to say. 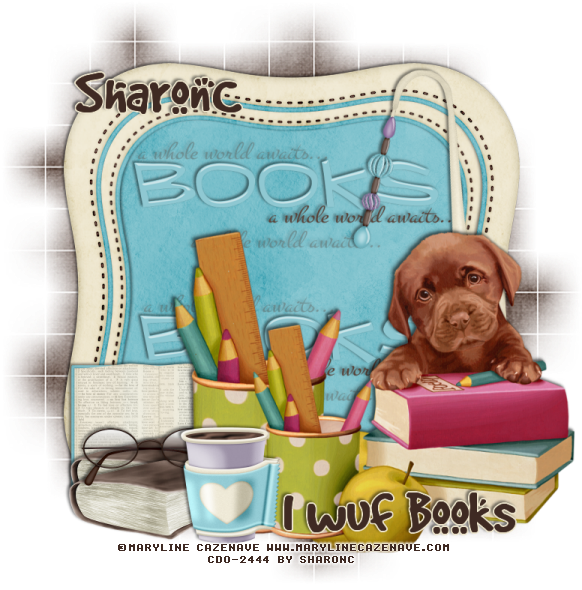 I typed out I wuf Books.